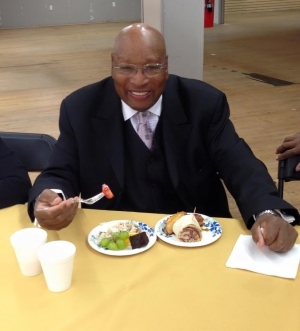 Dr. LaFayette James T. Trawick Sr.
that we announce the passing of Dr. LaFayette James Thomas Trawick Sr., beloved longtime member and elder of Trinity Temple SDA church. He will be widely and terribly missed. We ask that you keep the entire Trawick family in your prayers as they plan for the viewing and funeral services. We are sad to inform the family that after a long and brave fight with cancer David has passed away. We will also post the information for where your items of condolence can be sent as soon as possible. Jerome U. Trawick was born on November 7, 1954. He passed away at Shand's Hospital on Monday, April 27, 2015. He was preceded in death by his father, Ivory T. Trawick of Dothan, AL. Jerome leaves to cherish his memory; his mother, Doretha B. Trawick of Reddick, FL; one daughter Pamela Trawick-Black Bull, a former son-in-law, Rob Black Bull; two grandchildren, Devony Black Bull and Alex Black Bull, along with a host of great aunts, uncles, nieces, nephews, cousins and many sorrowing friends. Jerome was a graduate of North Marion High, class of 1973. He was employed at the University of Flordia for 18 years, was a custodian for Florida Power and was also employed at Ocala Sanitation/Waste Mgmt. He was an ordained Deacon at United Missionary Baptist Church under Rev. U.L. Ulmer during his early years. He was also a member of Mt. Zion United Methodist Church as a musician, a member of the Gospel All Star of Reddick, FL, and a longtime member of the Federation of Brothers of Ocala, FL., led by Deacon James Thorpe. Wife of the late Hugo McKissic. She passed away on March 3rd 2015. (Sister-in-law to Teresa, Harold & Delores Adams).